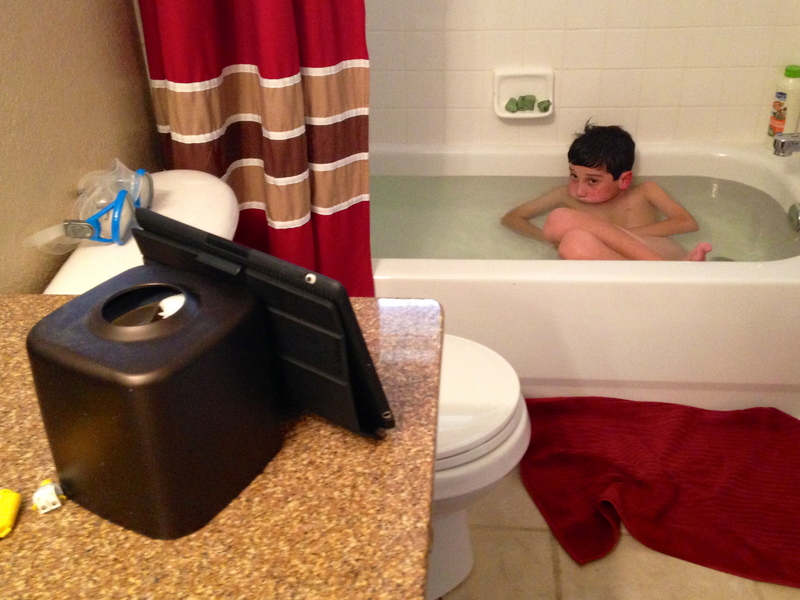 Shouldn’t every boy’s bathroom come with an iPad television? Since the school year began, I’ve had several opportunities to volunteer at our boys’ new school. While the main goal of these volunteer sessions has been to meet our household required number of volunteer hours, I’ve had the good fortune to spend most of those volunteer hours with my sons among their new friends. I went on a field trip with Joe to Sports Authority Field at Mile High to tour Broncos headquarters with his classmates. I worked at the annual Scholastic Book Fair and helped my sons select a plethora of new books for our ever-growing library of graphic novels. And, today, I helped the boys and their classmates make pies for Havern‘s annual Thanksgiving Day feast, which will be held this Wednesday during the boys’ regularly scheduled lunch times. The classes make the apple and pumpkin pies that the families will eat during that luncheon. It’s both a cost-saving measure (child labor is cheap, you know) and a way for the kids to gain some new skills while working with the occupational therapy team. During my volunteer session today, I got to watch Luke in action as he used one of those fancy apple peeler/corer/slicer gadgets that always seem like such an awesome thing until you discover all it really does in your house is collect dust back in the corner of a rarely opened cupboard. So there Luke was, quickly and artfully using the gadget that, frankly, I’ve been afraid to buy for fear of peeling, coring, and slicing off my own hand. I was impressed by how he took to the task and how deftly he was managing to use that thing without requiring dozens of stitches. After Luke had whipped through the murder of no less than six apples without any personal or property damage, it was time to turn the apple spirals into slices for the pie. Luke’s occupational therapist explained to the kids that they could unwind and tear the spirals into slices small enough to be tossed with lemon juice, sugar, and cinnamon for the pie filling. And so several children began doing just that. I grabbed an apple too and meticulously began tearing a half of each spiral layer off into a perfect apple slice while Luke stood and watched everyone for a minute. At last with great flourish he seized an apple. “Wouldn’t it go a lot faster if you just did this?” he asked as he simultaneously tore the peeled, cored, and spiral-sliced apple in half lengthwise through the missing apple core. There he stood with half the slices in one hand and the other half the slices in the other hand, looking at us all as if we were daft for not thinking of it first. Now I’m not ashamed to admit that my 10-year-old son figured out this simple and speedy solution while I dutifully followed the instructions of the person in charge. I’m also not ashamed to admit that his idea never even crossed my mind. I was too dang busy being proud of my baby for not following directions and for instead thinking outside the box and using his incredible spatial reasoning skills to cut through, quite literally, the core of the task. I love how Luke’s mind works. I see it when he looks at a photo of a Lego creation and describes to me how it goes together before ever opening the box or unwrapping one plastic block. I see it when he envisions a completed piece of art in his head and offers me a list of every item he will need to fabricate it. Luke’s spatial skills remind me that his dyslexia is a gift. His brain works differently, and it is awesome. The career of stay-at-home mom is often thankless, exhausting, and unnoticed. The days when you feel truly invigorated and confident are few and far between. Tonight I was enjoying Luke’s success vicariously by dreaming that somewhere along the line I’ve done something to contribute to his mental growth in a positive, outwardly visible way. Then, in the midst of my gleeful reverie, I heard my name being called loudly from down the hall. “Mom….Mom? ?” the cry came from the boys’ bathroom. It was Joe. “Mom…I need you. It’s important,” he called. And dutifully off I went to the bathroom. There I found Joe taking his ritual evening bath. He had his iPad propped up against the tissue box holder. I noted with an eye roll that Monday Night Football was on the screen. I love how my boys have turned their iPads into portable television sets. Rough lives they lead those two. “What, Joe?” I asked without attempting to hide my annoyance. “Can you hit Dismiss, please?” he asked. It was then that I noticed that the game was paused because his iPad battery was at 10%. Ugh. Are you kidding me? Welcome to the story of my life as Mom. Just when I’m feeling validated about my decision to stay home and raise these two school-struggling children into intelligent, decent, and reasonable human beings, one of them reminds me that I’m merely here to keep things up and running. Yep. My boys are all about making sure I’m keeping it real. Finn sat at dinner tonight and laid out his secondary academic career–his remaining years at Franktown, the interim years at Sagewood and the glory of finally moving on to Ponderosa. I didn’t even know which socks to put on at five. He scares me. Gotta love kids with a plan.